Nitric oxide synthases - NOSs are a family of enzymes catalyzing the production of nitric oxide (NO) from L-arginine. Glimepiride upregulates eNOS activity and inhibits cytokine-induced NF-kappaB activation through a phosphoinoside 3-kinase-Akt-dependent pathway. Diverse possono essere le cause di deficit da NO sintasi. diminuito trasporto di L-Arginina al'interno delle cellule endoteliali oppure competizione per il substrato tra la NO sintasi e la Arginasi. aumento dei livelli circolanti di inibitore. In particolare un potente inibitore della NO sintasi è la Dimetilarginina Asimmetrica (ADMA). L'aumentata presenza in circolo è spesso dovuta a diminuita attività della DimetilArginina DimetilAminoIdrossilasi, ma a volte si può imputare anche ad una aumentata metilazione delle proteine con conseguente aumento del rilascio di ADMA. diminuita sintesi di nNOS, le cui cause non sono ancora state chiarite. La NO sintasi è espressa dall'endotelio dei capillari ed un suo deficit può quindi manifestarsi clinicamente con forme fra loro molto diverse. This article portray thrombosis as a bland protective mechanism critical for stanching blood loss after injury: the prick of a lancet, the wound of a scalpel, or the predator’s fangs neatly trigger a proteolytic cascade culminating in fibrin formation and cross-linking. In the natural history of atherosclerosis, thrombosis involves an inciting injury more subthelan a wound. In such pathological states, the importance of an intricate interface between inflammation and thrombosis becomes apparent. blood pressure and systemic vascular resistance and to establish the role of endothelium-derived NO in the regulation of normoxic pulmonary vascular tone. The endothelium plays a central role in the dynamic regulation of vascular tone by synthesizing and releasing a relaxing factor with the physiochemical properties of nitric oxide (NO) or a closely related substance. The biosynthesis of NO in endothelial cells occurs in response to diverse physiological stimuli that perturb intracellular calcium flux. The response to injury hypothesis of atherosclerosis. Several different sources of injury to the endothelium can lead to endothelial cell dysfunction. One of the parameters associated with endothelial cell dysfunction that results from exposure to agents, such as oxLDL, is increased adherence of monocytes/macrophages and T lymphocytes. These cells then migrate between the endothelium and localize subendothelially. The macrophages become large from cells because of lipid accumulation and, with the T cells and smooth muscle, form a fatty streak. The fatty streak can then progress to an intermediated, fibrofatty lesion and ultimately to a fibrous plaque. As the lesions accumulate more cells, and the macrophages scavenge the lipid, some of the lipid- laden macrophages may emigrate back into the bloodstream by pushing apart the endothelial cells. On doing so, those at sites such as branches and biforcations, where blood flow is irregular with eddy currents and back currents, may become thrombogenic sites that lead to formation of platelet mural thrombi. Such thrombi can release many potent growth regulatory molecules from the platelets that can join with those released by the activated macrophages and possibly by lesion smooth muscle cells into the artery wall. Platelet trombi can also form at sites where endothelial dysjunction may have occurred. Ultimately, the formation and release of numerous growth-regulatory molecules and cytokines from a network established between cells in the lesion, consisting of activated macrophages, smooth muscle, T cells and endothelium, lead to progression of the lesions of atherosclerosis to a fibrous plaque or advanced complicated lesion. Each of the stages of lesion formation is potentially reversible. This lesion regression can occur if the injurious agents are removed, or when protective factors intervent to reverse the inflammatory and fibroproliferative processes. 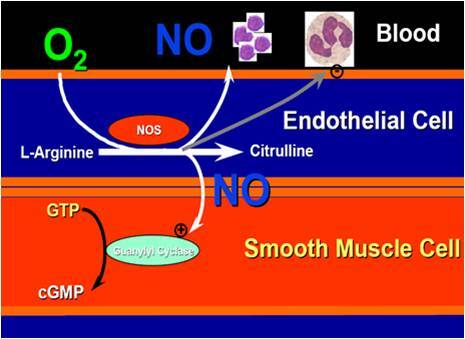 Nitric oxide (NO), the biologically active component of endothelium-derived relaxing factor, has critical roles in the maintenance of vascular homeostasis. 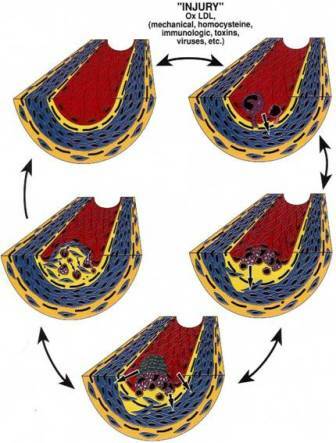 Decreased endothelial NO production, as a result of endothelial dysfunction, occurs in the early phases of atherosclerosis. NO appears to inhibit atherogenesis by inhibiting leukocyte and platelet activation and by inhibiting smooth muscle cell proliferation. Endothelial denudation is a prominent feature of vascular injury associated with percutaneous angioplasty, and decreased NO production appears to contribute to the restenosis process. . Manipulation of the NO/cGMP signal transduction system may provide novel therapeutic approaches for limiting atherogenesis and neointimal proliferation in the future. Since 1987, when nitric oxide (NO) was determined to account for the biological activity of endothelium-derived relaxing factor, intensive research has revealed widespread and disparate functions of this molecule as a signal transducer in mammalian systems. In the vasculature, NO not only functions as a vasodilator, it also inhibits platelet function, leukocyte adhesion to endothelial cells, and smooth muscle cell (SMC) proliferation. NO appears to have critical roles in cardiovascular homeostasis as well as the pathogenesis of hypertension and atherosclerosis. In this chapter, we review the biochemistry and vascular biology of NO and discuss the potential role of NO as an antiatherogenic molecule. The chemical structure of NO confers on it a variety of properties that facilitate its role as a biologic messenger. NO’s neutral charge allows diffusion across cell membranes to its intracellular targets. However, NO’s half-life is very short (on the order of seconds) in biological fluids, limiting the distance from synthesis site over which the molecule is active. NO has an unpaired electron, which makes it a highly reactive free radical species. NO combines with oxygen, forming metabolites and important toxic products, including peroxynitrite (ONOO ). NO can also complex with transitional metals, particularly iron in heme molecules, affecting the function of biologically active proteins. serve to allosterically alter protein configurations; stabilize, store and transport NO; or neutralize potentially toxic high levels of NO, depending on the redox state of the environment and the needs of the NO-producing cell . For example, NO can form an S-nitroso adduct with serum albumin, which circulates in plasma at concentrations three to four orders of magnitude higher than that of free NO and provides a reservoir for maintenance of NO delivery to tissues. whereas the gene encoding the inducible enzyme NOS II (iNOS) is localized to chromosome 7. There is evidence suggesting the existence of additional NOS II-like genes. Both in vitro and in vivo data suggest that NO negatively regulates leukocyte adhesion and chemotaxis, important steps in atherogenesis. Bath et al observed that NO inhibits monocyte chemotaxis in vitro via increased intracellular cGMP levels. Lefer & Ma found that the decreased basal NO release by hypercholesterolemic rabbit coronary endothelium is associated with a threefold increase in adherence of neutrophils to coronary endothelium. Reversal of the hypercholesterolemia with lovastatin increased basal NO production and decreased leukocyte-endothelial cell adhesiveness. Moreover, Kubes et al used intravital videomicroscopy of mesenteric venules in anesthetized cats to demonstrate enhanced leukocyte adhesion to venular endothelium during infusion of NOS inhibitors, which was reversed by L-arginine or by an antibody to the leukocyte adhesion molecule CD11b/CD18. These observations suggest that NO production by the vascular wall limits leukocyte adhesion and migration into the subintimal space, a critical step in atherogenesis. Vascular SMC are normally quiescent in the adult in vivo, rarely exhibiting mitogenic activity in their contractile state. However, during atherogenesis, these cells are activated to a “synthetic” state, which allows them to proliferate and migrate into the intima and to produce extracellular matrix. Proliferation of vascular SMC in culture is inhibited by both exogenous NO donors and endogenous NO production. Garg & Hassid observed that three structurally distinct NO-generating vasodilators inhibited rat aortic SMC proliferation. In addition, when endothelial cells and SMC were cultured together, SMC proliferation was inhibited, an effect that was abolished by the addition of the NOS inhibitor nitro-L-arginine. Conversely, in another study, NO was found to amplify the effect of fibroblast growth factor on smooth muscle proliferation. Nonetheless, it appears that, under most conditions, intact endothelium performs an important function in negatively regulating SMC proliferation. Observations of many investigators suggest that NO inhibits atherogenesis and the neointimal response to vascular injury. It is therefore reasonable to anticipate that one or more methods designed to augment NO synthesis or responsiveness may be beneficial for the prevention and/or treatment of atherosclerosis or for the attenuation of neointimal formation after vascular injury. As described above, increased vascular NO levels might be achieved using systemic or local delivery of NO donor compounds or overexpression of a NOS gene using intravascular gene therapy techniques. Other approaches might include supplementation of NOS enzyme substrate (L-arginine) or co- factors [such as tetrahydrobiopterin] and increasing the half-life of NO by inhibiting superoxide production with superoxide dismutase. Methods de- signed to augment NO responsiveness may also be useful for the treatment of vascular diseases. For example, cGMP phosphodiesterase inhibitors would be expected to augment and prolong the response to NO by decreasing cGMP inactivation. Although several of these approaches have been studied in animals, none has been demonstrated to be efficacious in patients. It is worth noting that, although many patients with symptomatic atherosclerosis involving the coronary vasculature receive NO donor compounds, these drugs have not been reported to limit the progression of atherosclerosis. The limitations of the most commonly used NO donor compounds, nitrates, include the requirement for biotransformation via nitrosothiol formation and nitrate tolerance. It also may not be feasible, because of systemic hypotension, to achieve the vascular concentrations of NO donor compounds required to inhibit atherogenesis. The development of new NO donor compounds, which do not require biotransformation, may prove to be the key to realizing the antiatherogenic effects of this class of drugs. Another approach to increasing vascular NO is directed at treating endothelial dysfunction. Recent published trials provide evidence that therapy for hyperlipidemia can improve endothelium-dependent relaxation in patients with hypercholesterolemia and in patients with coronary artery disease. Moreover, combined cholesterol-lowering and antioxidant therapy with lovastatin and probucol was recently found to be more effective in restoring acetylcholine-induced coronary vasomotion than cholesterol-lowering therapy alone in borderline to hyperlipidemic, nonsmoking, nondiabetic patients. Because cholesterol-lowering therapy can cause regression of atherosclerosis and improve endothelial function, it seems probable that these drugs act in part by increasing endothelial NO production. The ability to measure systemic endothelial function noninvasively at the brachial artery provides a novel method for potentially assessing the efficacy of therapy for hyperlipidemia. NO, a highly reactive biologic signal transduction molecule, plays a key role in vascular homeostasis and is uniquely capable of affecting key processes in atherogenesis and in restenosis after vascular injury. In the presence of normally functioning endothelium, constitutively produced NO appears to limit LDL oxidation, leukocyte and platelet activation and adhesion, and SMC proliferation and migration into the intima. With endothelial dysfunction or damage, loss of NO production appears to favor the development of atherogenesis and neointimal formation. Augmentation of NO production or responsiveness may prove to be a successful treatment modality for combating atherogenesis and the neointimal response to vascular injury. "**Cytoprotective actions of nitric oxide donors in ischaemia-reperfusion injury. Lefer AM In: Moncada S, Marletta MA, Hibbs JB Jr, Higgs EA, eds. The biology of nitric oxide. Vol. 1. London: Portland Press, 1992:55-6. **"